The MTN Ligue 1 2011, the top level of Ivorian football, has finally kicked off. As always, information about teams and players is difficult to find, perhaps more difficult than ever because of the problems the country has experienced lately. However, there are still a lot of very exciting players in the local league and here are some of my observations from the first rounds. * The two promoted teams in the Ivory Coast are ASI Abengourou and Adzopé FC. The striker Georges Henri Griffiths (born 24.02.1990) scored the first goal of the season for ASI Abengourou. The club has apparently signed Cameroonian goalkeeper Cyrille Ondoa (born 18.04.1988), formerly of Africa Sports and ASC Ouragahio, but this is yet to be confirmed. Adzopé FC has already scored five league goals but information about the club is almost impossible to find. * AFAD Djékanou looks strong this year. Several players from my article “The talents from AFAD Djékanou” are still with the club, including playmaker Cheick Moukoro (born 12.06.1991), central defender Mady Gbokoua, midfielder Souleymane Ouattara (born 11.02.1990) and striker Serge Konan Kouadio (born 31.12.1988). Goalkeeper Clovis Tahourou (born 25.12.1989), formerly of ASEC Mimosas, is one of the best in the league and currently part of the Ivory Coast U-23 national football team. Ousmane Gnada (born 24.03.1990) is a great substitute goalkeeper. The signing of versatile defender Kouakou Mansou (born 10.05.1991) from Stade d’Abidjan could very well be a scoop. Mansou has been a key member of both the Ivory Coast B and the Ivory Coast U-20 national football team for the last couple of seasons. Expectations are also high regarding petit midfielder Sanga Topio Coulibaly (born 17.08.1988). Coulibaly is a new signing from ASEC Mimosas where he only managed one league match during the MTN Ligue 1 2010. Competition will not be as tough at AFAD Djékanou. Midfielder Arsene Konan Kouakou (born 10.04.1990) was captaining the team in the season opener against Jeunesse Club d’Abidjan. AFAD has also signed experienced attacker N’Dri Fabrice Kouadio (born 24.11.1984) from Issia Wazi FC. * Africa Sports FC from Abidjan has traditionally been one of the biggest clubs in the country but their start of two wins and two losses have not been impressive. Abdoul Karim Cissé (born 20.10.1985) is apparently first choice goalkeeper. Cissé is a former member of the Ivory Coast B national football team. Kouassi Nicaise N’Goran (born 08.02.1988) is leading the defensive line, together with Konan Ruffin N’Gouan (born 15.05.1990), left-back Jean-Baptiste Kaboré (born 30.06.1984), Nesson Zoin and Armand Boti Bi Tié (born 14.10.1988), a new signing from Denguélé d’Odienné. Midfielders Dalla Coulibaly (born 28.05.1987), Désiré Magloire Kouamé (born 17.03.1982) and Rouxel Franck Derou (born 20.10.1988) are all experienced players and key members of the team. Africa Sports FC has signed two very exciting, though highly inexperienced players in Mohamed Vieira Sanogo from SOL FC and Baba Salia Ouattara (born 24.04.1990) from Denguélé d’Odienné. Both players have already scored their first league goal for their new club. * SO Armée, often referred to as SOA, have won three of their first four matches so far this season. Powerful striker Jean Brossou Kpéhi (born 29.05.1984) scored 17 goals for Sabé Sports de Bouna in 2009 but failed to impress at ASEC Mimosas in 2010, playing 13 matches and scoring 5 goals. Brossou Kpéhi will most likely play regularly for his new club SOA during the current campaign and has already three goals to his name. Simon Kangoh and Roger Claver Assale (born 13.11.1993) have also made great starts to the season, both having scored two goals in four matches. Attacker Agoussi Okan (born 23.12.1995) is only 15 years old according to www.fif-ci.com but has already scored his first league goal for SOA. Perhaps a player to watch. Other key players at SOA include defender Didier Boris Kadio (born 05.04.1990), who played 10 matches (one goal) for ASEC Mimosas in 2010, midfielder Issoumaïla Lingané (born 15.03.1991), who played 13 matches (no goals) for ASEC Mimosas in 2010, and the experienced goalkeeper Guyan Kanté (born 05.01.1982). * As always, ASEC Mimosas looks stronger than any other team in the MTN Ligue 1 2011. Giant goalkeeper Moussa Sanogo (born 13.08.1987) has been signed from Suphanburi FC of Thailand and started the first match of the season. Youngster Adama Cissé (born 31.12.1992) played the next. The usual number one is however Daniel Yeboah (born 13.11.1984), a full international goalkeeper for the Ivory Coast. The central defence looks very strong, consisting of Robert Sankara (born 18.02.1985) from Burkina Faso, a new signing from Stade d’Abidjan, and Hamed Hervé Diomandé (born 17.06.1988) who is quite an experienced performer despite being only 23 years old. Gauthier Koffi (born 29.01.1991) looks strong at right-back. Koffi was signed from Sabé Sports de Bouna before the season. The left-back is Zahui Okou (born 11.06.1988). Jean-Jacques Bougouhi (born 12.06.1992), a very promising striker, is definitely a player to watch, although he only managed one league match for ASEC Mimosas in 2010. Bougouhi recently scored for the Ivory Coast U-23 national football team when they beat Congo U-23 in a qualifier for the 2012 Olympics. The picture, taken from daylife.com, is of Jean-Jacques Bougouhi (right) and Gauthier Koffi (left). * Jeunesse d’Abidjan has yet to score after three matches. JCAT has several quality players, including goalkeeper Sylvain Komenan (born 20.12.1982), defender and captain Mathias Kassi Akesse (born 21.02.1982) and Nigerian midfielder Michaël Ogundina (born 06.07.1984). However, JCAT will be missing their star player Tchétché Kipré (born 16.12.1987) who has reportedly, somewhat surprising to me, signed for Azam FC from Tanzania. Kipré won the “Best player-award” after the MTN Ligue 1 2010. * Séwé Sport de San Pedro is an ambitious side with several interesting players. Goalkeeper Badra Ali Sangaré (born 30.05.1986), right-back Mahan Marc Goua (born 02.11.1989) and midfielder Marcelin Koffi (born 06.04.1985) have all played for the Ivory Coast B national football team. Goua is the captain of the team and was part of the Séwé Sport team that won promotion to the MTN Ligue 1 after the 2008 season. 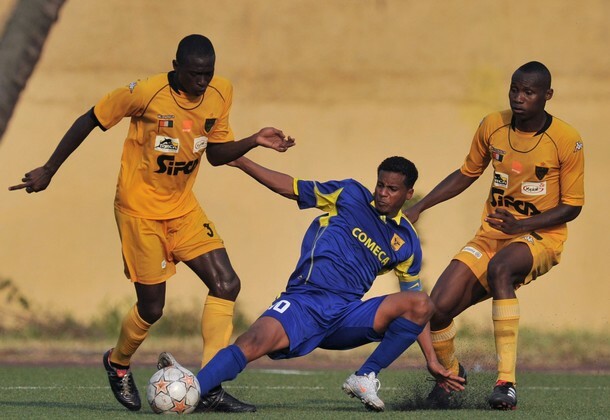 Some of the more attacking-minded players at Séwé have previously played for the top club ASEC Mimosas, including creative midfielder Kabran Stevens Koffi Foba (born 12.08.1989), right-winger Sédé Marc Dion (born 20.09.1987) and attackers Ladji Tiezan Koné (born 15.05.1989) and Ismaël Beko Fofana (born 08.09.1988) New signings include Wilfried Kipré Bolou (born 16.12.1987), the highly-regarded attacking midfielder from FC Hiré, and Issouf Sangaré (born 23.10.1986), an attacker from SO Armée. * Jacques Alain Tanoh (born 07.07.1988) is back in the Ivory Coast and Stella Club d’Adjamé. Tanoh is a speedy attacker and was a key player for the Ivory Coast B national football team in 2008 and 2009. He already has two goals to his name in the current season.